Saint Francis was born in 1182 in Assisi, Italy. He died in 1226 at the age of 44, worn out with a combination of illnesses and ailments, including tuberculosis and malnutrition, the legacy of years of self-denial and hardship. 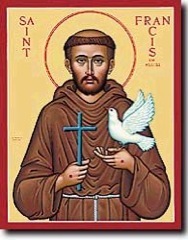 More than 800 years after he was born, St. Francis remains one of the most popular personalities in history. His love of God, his love for people, and indeed for all creation; his compassion for all who suffered; and the joy with which he proclaimed God's love and communicated it to others — all this makes him a very attractive figure. Francis was the son of Pietro Bernardone, a wealthy merchant, who had high expectations of his son. In his youth, Francis too had dreams of glory and was involved in an ill-fated military expedition against the neighbouring town of Perugia, which resulted in his imprisonment. After his release and over a period of time a change came over Francis. He began to spend long periods in prayer. He began to help the poor with things from his father's shop. And, according to his own Testament, a major change took place in his attitude to lepers. At first he was revolted and disgusted at the sight of them. One incident is told of how he met a leper on the road. His first instinct was to run away. But Francis, moved by something he did not yet understand, embraced the leper instead. It was a turning point in his life. From then on, he sought their company and cared for them, coming to recognise in them the image of the suffering Christ, rejected and abandoned. 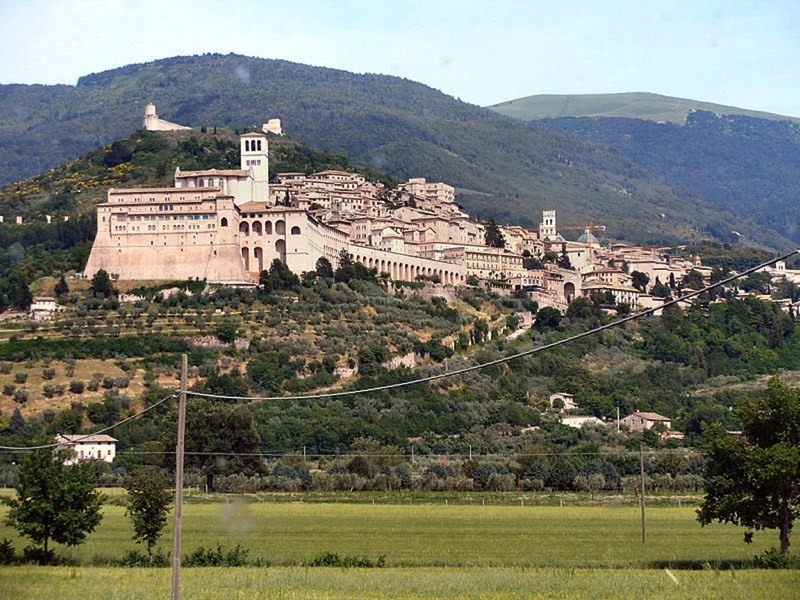 One day, Francis stopped to pray in a dilapidated church called San Damiano, not far from Assisi. As he prayed, he seemed to hear the voice of Christ speaking to him from the Crucifix: "Francis, go and repair my house, which, as you can see, has fallen into ruin." Francis took the instruction literally, and set to work. He took some goods from his father's store, sold them and brought the money to the priest who had charge of the church, telling him it was for repairs. The priest, probably familiar with Francis and his father, and his father's temper, refused to accept it. Francis threw down the money in a window ledge and left. Needless to say, his father exploded! Francis spent some weeks in hiding before returning home, whereupon his father chained him up in a cellar. But while his father was away on business, his mother released him. On his return, Pietro decided he had had enough. Finally losing patience with his son, he brought Francis to court. In those days, family disputes were often settled, not in the civil courts, but in Church courts, which were aimed at bringing about reconciliation and harmony. In Assisi the bishop himself presided. Francis's father told how he had given his son everything and was repaid with ingratitude; and that Francis was giving away his property to the poor. At this, Francis stood, stripped off his clothes and handed them back to his father, saying: "From now on I no longer call Pietro Bernardone my father; now I can say: "Our Father, who art in heaven!" With this gesture, Francis broke free from everything which he saw as an obstacle between him and God. From now on he would be totally dependent on God's love and providence. In place of limited family ties and loyalties, Francis now saw himself and the whole of creation as part of one great family; and he began to refer to everything as his brother or sister: Brother Sun, Sister Moon, etc. By abandoning a life of privilege, and renouncing all personal property, Francis saw himself as imitating Jesus Christ who "chose poverty", setting aside His glory to share our human life. And, obedient to Christ's command as he understood it, Francis set about repairing San Damiano with his own hands, begging stones on the street as he needed them. This was the first of several Churches that he repaired. One was a little chapel in the woods, known as the Portiuncula or "little portion". It was one of Francis's favourite places and it was there that he was to die. But rebuilding "Christ's house" was to involve much more than fixing buildings: it was to involve a spiritual revolution. "As you go, proclaim that the Kingdom of Heaven is close at hand. Cure the sick, raise the dead, cleanse the lepers, cast out devils. You received without charge, give without charge. Provide yourselves with no gold or silver, not even with a few coppers for your purses, with no haversack for the journey or spare tunic or footwear or a staff, for a workman deserves his keep" (Matthew 10:7–10). Francis exclaimed: "This is what I wish; this is what I am looking for; this is what I long with all my heart to do!" And he set off preaching the Gospel with such joy and obvious sincerity that he touched people's hearts. His basic message was communicated not by what he said, but by the example of his own life. Gradually, a number of men were attracted to Francis and joined him in his way of life. As St. Francis said: "The Lord gave me brothers." From the beginning Francis insisted that they were all to regard one another as brothers and indeed, "lesser brothers" (or "friars minor"); that is, that they were to be at the service of all. Some were priests but Francis himself was never ordained a priest. Unlike other religious Orders, where leaders were given titles like "abbot" (father) or "prior" (first), Francis insisted on the equality of all the brothers. The basic "rule" of their community was simply "to live the Gospel" and when he sent his brothers out to spread the Gospel, he would tell them: "Proclaim the Gospel; and, if necessary, use words!" For it was by the example of their lives and the cheerfulness and joy that they showed, that people could really appreciate the "Good News" of Jesus Christ. As numbers grew, Francis decided to look for approval from the Pope for the way of life he had adopted. So in 1209 he went to Rome and after some delays managed to see the Pope. At first the Pope, Innocent III, was not very impressed by Francis. But, so the story goes, during the night he had a dream in which he saw a poor and ragged man propping up a collapsing Church, and he recognised the man as Francis. So he gave Francis verbal approval for his Order. Francis was eager to spread the Gospel not only in Italy but throughout the world and on 24th June 1219, accompanied by twelve brothers, he set sail for Egypt. At the time, the Crusaders were besieging the city of Damietta. Taking advantage of a temporary truce, Francis, with one companion, crossed the lines and went to visit the Egyptian leader. This was Malik al-Kamil, Sultan of Egypt, Syria and Palestine. He was the nephew of the great Saladin who had withstood the crusading efforts of Richard I (the "Lionheart") of England. Francis and his companion were captured and beaten up, but eventually were brought before the Sultan. Malik al-Kamil was so impressed by Francis's obvious sincerity and openness that he developed an affection as well as respect for him. The story goes that he was "almost" converted to being a Christian. Francis refused to accept the divisions that fear, jealousy and (most of all) greed created between people. He refused to be anyone's enemy, and so could not recognise anyone as his. In this way he became an apostle of peace. He even succeeded in making peace between his own town of Assisi and their traditional rivals, Perugia, where he himself had been imprisoned as a young man. On his return to Italy, Francis found that in his absence great changes had taken place in the Order. The large numbers of people entering and the need to set up facilities for formation and training had led to the setting up of larger houses and a more settled form of life. This led to disputes among the brothers. In 1220, Francis resigned as general minister and was succeeded by Brother Peter Catanii. He in turn was succeeded by Brother Elias. Brother Elias clearly loved and respected Francis, but had quite different ideas as to the future of the Order: he was an "organisation man", good at administration; Francis was the one with the vision and the charisma to make it a reality. Though he had relinquished formal leadership of the Order Francis remained the source of inspiration for the Order. In 1221 he wrote a "Rule" to govern the Order, and in 1223 a second, shorter and more concise Rule. This second Rule was approved by the Pope and became the Rule of life for all Franciscan friars down to the present day. All his life, Francis was entranced by God's love as shown through Jesus Christ. He was overwhelmed at the "humility of God" shown in the Incarnation when the Son of God came to share our life on earth as a helpless baby; and by the love shown by Jesus in His passion and death on the cross. These two things, we are told by the first of his biographers "occupied Francis's mind, to the extent that he wanted to think about hardly anything else." On Christmas Eve of 1223, at Greccio, Francis set up a representation of the Bethlehem scene in a cave on the side of a mountain, with real animals. People gathered from all around and Mass was celebrated during which Francis preached.The Greccio crib brought home in a dramatic way to the people the coming of Jesus into the world and His continued presence in our lives. The following year brought an even more dramatic event. Francis was keeping a forty day period of prayer and fasting on the mountain of La Verna, when he experienced an apparition of a "seraph" (angel or messenger of love). For Francis the supreme example of God's love was Christ's passion and death for love of us, a love he longed to share. When the vision ended, the marks of Christ's crucifixion were imprinted on Francis's own body, his hands and feet and side.